By Stephen Palmer and Karen Schloss. Imagine yourself as a graphic designer for New Age musician Enya, tasked with creating her next album cover. Which two or three colors from the grid below do you think would “go best” with her music? Would they be the same ones you’d pick for an album cover or music video for the heavy metal band Metallica? Probably not. For years, my collaborators and I have been studying music-to-color associations. From our results, it’s clear that emotion plays a crucial role in how we interpret and respond to any number of external stimuli, including colors and songs. In one study, we asked 30 people to listen to four music clips, and simply choose the colors that “went best” with the music they were hearing from a 37-color array. In fact, you can listen to the clips yourself. 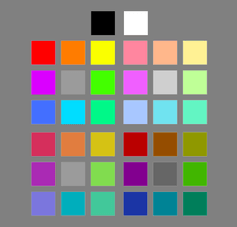 Think about which two to three colors from the grid you would choose that “go best” with each selection. The image below shows the participants' first-choice colors to the four musical selections provided above. Selection A, from Bach’s Brandenburg Concerto Number 2, caused most people to pick colors that were bright, vivid and dominated by yellows. Selection B, a different section of the very same Bach concerto, caused participants to pick colors that are noticeably darker, grayer and bluer. Selection C was an excerpt from a 1990s rock song, and it caused participants to choose reds, blacks and other dark colors. Meanwhile, selection D, a slow, quiet, “easy listening” piano piece, elicited selections dominated by muted, grayish colors in various shades of blue. But why do music and colors match up in this particular way? If colors have similar emotional associations, people should be able to match colors and songs that contain overlapping emotional qualities. They may not know that they’re doing this, but the results corroborate this idea. We’ve tested our theory by having people rate each musical selection and each color on five emotional dimensions: happy to sad, angry to calm, lively to dreary, active to passive, and strong to weak. We compared the results and found that they were almost perfectly aligned: the happiest-sounding music elicited the happiest-looking colors (bright, vivid, yellowish ones), while the saddest-sounding music elicited the saddest-looking colors (dark, grayish, bluish ones). Meanwhile, the angriest-sounding music elicited the angriest-looking colors (dark, vivid, reddish ones). These results support the idea that music-to-color associations in most people are indeed mediated by emotion. 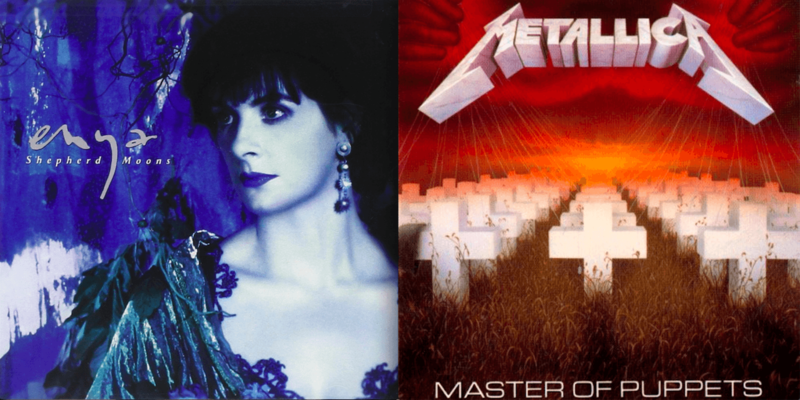 The album cover designers for Enya’s Shepherd Moons and Metallica’s Master of Puppets may have subconsciously chosen colors that matched the emotional qualities of the respective artists' music. There’s a small minority of people – maybe one in 3,000 – who have even stronger connections between music and colors. They are called chromesthetes, and they spontaneously “see” colors as they listen to music. For example, a clip from the 2009 film The Soloist shows the complex, internally generated “light show” that the lead character – a chromesthetic street musician – might have experienced while listening to Beethoven’s Third Symphony. Chromesthesia is just one form of a more general condition called synesthesia, in which certain individuals experience incoming sensory information both in the appropriate sensory dimension and in some other, seemingly inappropriate, sensory dimension. The most common form of synesthesia is letter-to-color synesthesia, in which the synesthete experiences color when viewing black letters and digits. There are many other forms of synesthesia, including chromesthesia, that affect a surprising number of different sensory domains. Some theories propose that synesthesia is caused by direct connections between different sensory areas of the brain. Other theories propose that synesthesia is related to brain areas that produce emotional responses. The former theory implies little or no role for emotion in determining the colors that chromesthetes experience, whereas the latter theory implies a strong role for emotion. 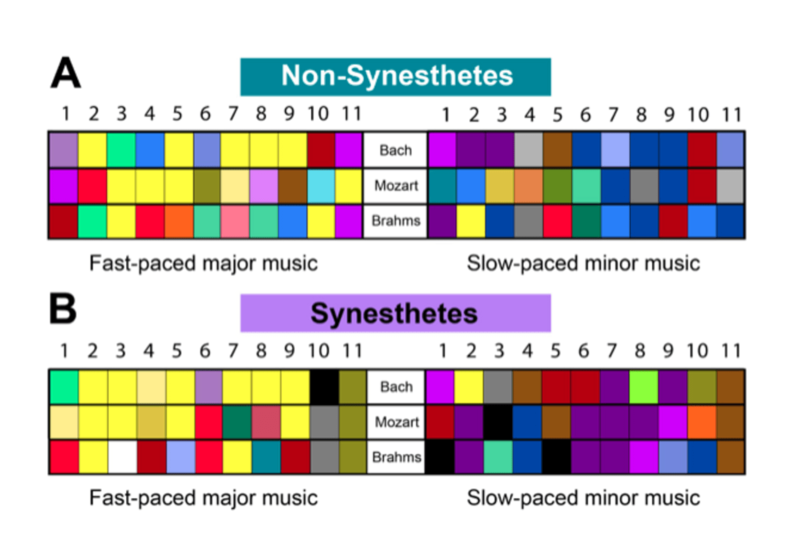 The left side of the image below shows the first choices of the syensethetes and non-synesthetes for fast-paced classical music in a major key (like selection A), which tends to sound happy and strong. The right side shows the color responses for slow-paced classical music in a minor key (like selection B), which tends to sound sad and weak. The color experiences of chromesthetes (Figure B) turned out to be remarkably like the colors that non-chromesthetes chose as going best with the same music (Figure A). But we mainly wanted to know how the non-chromesthetes and chromesthetes would compare in terms of emotional effects. 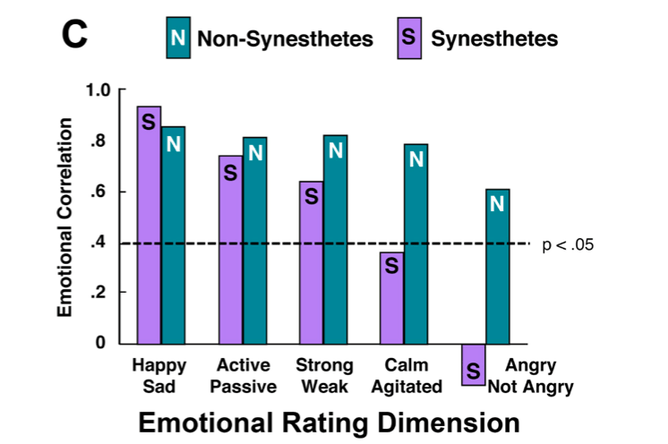 The results are depicted in Figure C.
Interestingly, the emotional effects for chromesthetes were as strong as those for non-chromesthetes on some dimensions (happy/sad, active/passive and strong/weak), but weaker on others (calm/agitated and angry/not-angry). The fact that chromesthetes exhibit emotional effects at all suggests that music-to-color synesthesia depends, at least in part, on neural connections that include emotion-related circuits in the brain. That they’re decidedly weaker in chromesthetes than non-chromesthetes for some emotions further suggests that chromesthetic experiences also depend on direct, non-emotional connections between the auditory and visual cortex. The fact that music-to-color associations are so strongly influenced by emotion raises further questions. For example, why is it that fast, loud, high-pitched music “sounds” angry, whereas slow, quiet, low-pitched music “sounds” calm? We don’t know the answers yet, but one intriguing possibility is what we like to call “musical anthropomorphism” – the idea that sounds are emotionally interpreted as being analogous to the behavior of people. For example, faster, louder, high-pitched music might be perceived as angry because people tend to move and speak more quickly and raise their voices in pitch and volume when they’re angry, while doing the opposite when they’re calm. Why music in a major key sounds happier than music in a minor key, however, remains a mystery. Artists and graphic designers can certainly use these results when they’re creating light shows for concerts or album covers for bands – so that “listening” to music can become richer and more vivid by “seeing” and “feeling” it as well. But on a deeper level, it’s fascinating to see how effective and efficient the brain is at coming up with abstract associations. To find connections between different perceptual events – such as music and color – our brains try to find commonalities. Emotions emerge dramatically because so much of our inner lives are associated with them. They are central not only to how we interpret incoming information, but also to how we respond to them. Given the myriad connections from perceptions to emotions and from emotions to actions, it seems quite natural that emotions emerge so strongly – and perhaps unconsciously – in finding the best colors for a song.